Max is probably more stylish than me. I feel like I channel my inner fashionista into his outfits. Or he's just sucked out every stylish bone in my body. Next: They have one of the best winter ranges out at the moment. 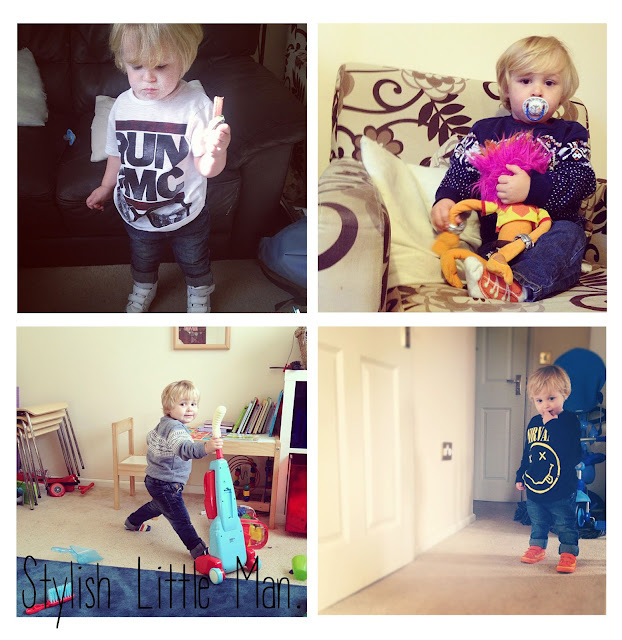 Max is forever wearing his slim fit jeans that fit him perfectly - even with a bulky nappy on. They have just collaborated with Live Nation to create some childrens band tops which we snapped up. The collection includes some great bands such as Nirvana, Blur, Stone Roses and Run DMC. With the weather being cold but not freezing we are layering him up and their pull over jumpers have great designs on them, channelling aztec prints and cute dinosaur knits. Vans: Not a brand you would normally associate with kids but their shoe range are the most hard wearing and robust that I've seen Max wear. They take their experience with adult skate shoes and replicate them in the kids shoes. Max's favourite pair seem to be his bright orange ones from the Vans x Yo Gabba Gabba collaboration but my personal preference are his two tone blue ones that look great with his smart outfits. There are so many other brands I could talk about, from the supermarkets to the higher end Alex and Alexa but I'll leave you to browse the pages I've left with you now! Any brands you can recommend for your little ones?